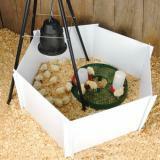 For watering chicks and small scale poultry flocks. Simple design that's easy to use and clean. Designed to be shallow and narrow lipped to help prevent chicks from drowning. 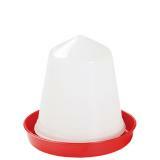 Coned top prevents birds from roosting. The exact number of birds to water is difficult to determine as there are many factors that influence intake; salt and protein levels in the diet, humidity, temperature, productivity (growth or egg production) and the birds ability to process feed and water. 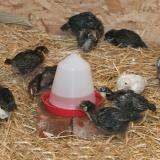 I’ve used these waterers in my brooders for a while now and find them really easy to clean, chicks use them fine and the narrow rim actually collects less bedding in the water than my previous waterers. Very happy with these. 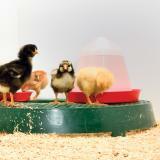 Just what I needed for my chicks.